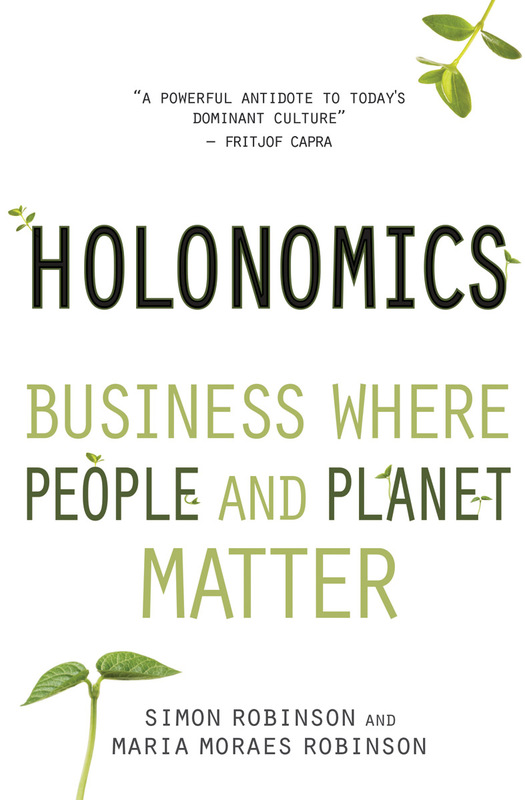 Both Maria and I are very happy to be able to announce our new book Holonomics: Business Where People and Planet Matter. It is being published by Floris Books from Edinburgh, and will be launched in April of next year. Holonomics came about after many requests for recommended texts from our students and clients who were looking to explore more deeply the themes of complexity, sustainability, strategy, innovation, leadership and change management. Our aim was to capture in a single volume the philosophy and teachings from Schumacher College, and particularly the unique masters degree Holistic Science – a radical rethinking of our ecological, social and economic systems. In structuring the book into three parts – The Dynamics of Seeing, The Dynamics of Nature and The Dynamics of Business – we then wished to show how these teachings could be implemented in a practical manner in business, governmental and other organisations based on our many years of experience in industry, in both the private and public sectors. We decided to coin a new definition for the word ‘holonomics’, which for us is a combination of the words ‘whole’ and ‘economics’. The Greek origins of these words contain three components; ὅλος (holos – all, whole, entire, total), οἶκος (oikos – house) and νόμος (nomos – custom or law). Economics can be thought of as the understanding of the laws and customs of our home (oikos + nomos). We cannot have a limited view of our home, for home is a living planet of finite resources. Our understanding of economics has to encompass an understanding of the wholeness of nature and business systems in all their complexity, and this can only come from what we call ‘holonomic thinking’ – a dynamic and authentic understanding of the relationships within a business system, and an appreciation of the whole. Part One of our book is devoted to leading the reader into the dynamics of seeing. These four chapters introduce the reader to the work of Henri Bortoft who passed away in 2012, just a few months after the publication of his final work Taking Appearance Seriously: The Dynamic Way of Seeing in Goethe and European Thought. While Henri was writing this book, the name he almost settled on was The Dynamics of Being. It was at the last moment that he had the inspiration to call it Taking Appearance Seriously, a name which is a philosophical play on the word ‘appearance’. Holonomics is divided into three parts – The Dynamics of Seeing, The Dynamics of Nature, and The Dynamics of Business – in honour of the profound insights of Henri, and is written in a manner that will lead the reader towards their own understanding and experience of the dynamics of being. The days of compartmentalisation are passing. We are at the dawn of a new age where we must look for unity in diversity, the big picture in small parts, macrocosm in microcosm, large vision in little details and Holonomics in economics. We can enter this new age of wholeness by the act of deep seeing, by expanding our consciousness, and by transforming our perceptions. This book is a handy tool to accomplish such metamorphosis, a manual to move from a linear model to a cyclical system of business. Further information about the book is available on Floris Books’ website here. It has been wonderful working with Floris, especially as they have already published a number of other books from members, teachers and friends of Schumacher College, including Henri Bortoft (The Wholeness of Nature, Taking Appearance Seriously), Brian Goodwin (Nature’s Due: Healing Our Fragmented Culture), Stephan Harding (Grow Small, Think Beautiful: Ideas for a Sustainable World from Schumacher College) and Craig Holdrege (Thinking Like a Plant: A Living Science for Life). We do hope that many of you will enjoy reading Holonomics, and that it will help you in your work integrating complexity, systems thinking and sustainability into a wider organisational and educational context. Holonomics: Business Where People and Planet Matter by Simon Robinson and Maria Moraes Robinson, with a foreword by Satish Kumar is published by Floris Books, Edinburgh, 24th April 2014. ISBN 9781782500612, 192 pages with 30 B/W images, illustrated and rendered with the generous help of Michael Pruett. An eBook version will be available as well. Please also see our Holonomics page on Facebook. The authors of this remarkable book have distilled the essence of the ideas and values taught at Schumacher College, a unique transformative learning centre based on systemic thinking and grounded in deep ecology, and they show how these teachings can be applied with many case studies of enlightened businesses. Holonomics is a powerful antidote to the fragmentation and materialistic orientation of today’s dominant culture. The central question of our time is “How can we live divided no more?” This wonderful book provides the science, the philosophy and the business practices that lead us to an answer. The Robinsons present the concepts and thinkers who first awakened a new sense of excitement and possibility in me many years ago. What a gift to have these monumental, mind-changing ideas woven together skilfully in one book. If you absorb their perspectives, you can’t help but have your mind changed—for the benefit of both people and planet. Holonomics portrays reality in our universe as the interconnectedness of all to one and one to all. While great poets, artists and modern scientists intuitively see reality as relationships, economists, politicians, and business leaders fail to understand how parts and the whole relate in the world we inhabit. This failure now causes human economic activity to steadily diminish the quality of life as it has existed on Earth until very recently. In Holonomics: Business Where People and Planet Matter, Simon and Maria Robinson draw from works by several holistic thinkers, most notably the late Henri Bortoft, to present a powerful mode of thinking that promises to deliver a new and life-enhancing approach to human economic activity. I urge all economists, elected public officials, and people in business to connect with the timely and important message the Robinsons convey to us in Holonomics.